I recently decided to get the new Fitbit Flex. I had previously used the Fitbit Ultra, which is no longer available for sale because they have new models now. Instead Fitbit Ultra, Fitbit now has its successor as the Fitbit One, or you can choose the Fitbit Flex, which is wearable on the wrist. 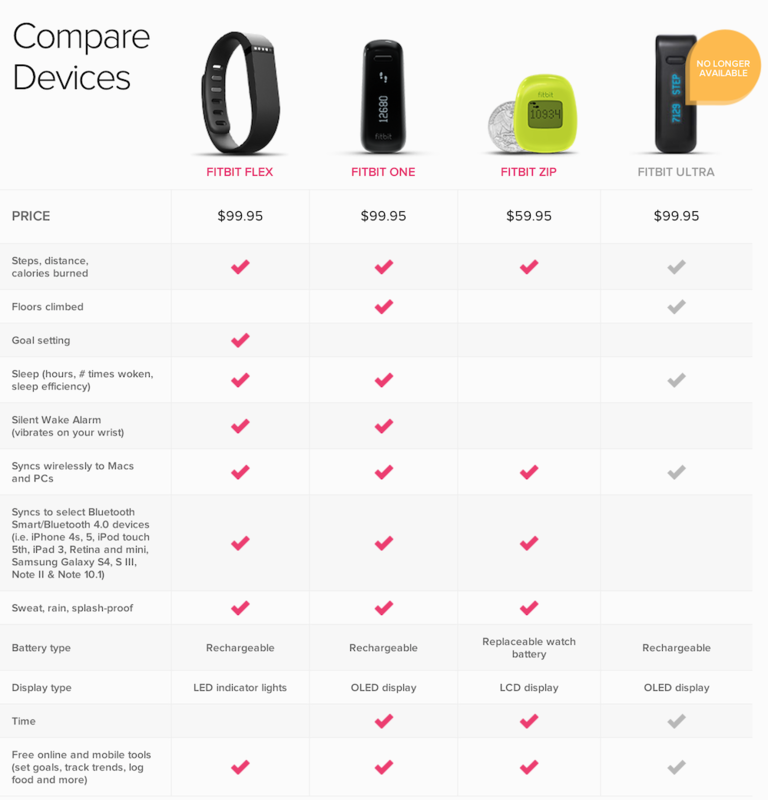 Here’s a comparison of the Fitbit devices. I had been a fan of Fitbit from the beginning and was one of the early adopters. It was really useful to be able to track my daily activity, as well as my lack of sleep. However, I had issues with the Fitbit Ultra mostly surrounding how easy it was to lose and how fragile the clip (and difficult to replace) it was. Back in 2012, Fitbit really had great customer support and was very gracious about replacing the product when it was lost. I am a mother of two young children, so those two factors did bother me enough that I stopped using Fitbit Ultra and gave it to a child-free friend. This time around, I decided to try Fitbit Flex (which is worn around the wrist). During the time which I was not using the Fitbit, I tried the Nike FuelBand. It was a more expensive product at $149.00, compared to the $99.95 for Fitbit product, but as it was easier to wear, I decided to give it a try. I bought the Nike Fuel Band back in September 2012 and now have had a year’s worth of experience dealing with it, so I will compare my experience with the two companies’ customer support as well as their products now with slightly different angle than many of the review articles out there. When I purchased my Nike FuelBand in September 2012, I was not sure how well I would like it. First, it ONLY tracks activity (not sleep) and it had its own “Nike Fuel” points. Nike explains this of Nike Fuel: “Unlike calorie counts, which vary based on someone’s gender and body type, NikeFuel is a normalized score that awards all participants equal scoring for the same activity regardless of their physical makeup.” All the data that goes up on Nike’s website and is locked up there forever (you can’t export it), and the application does not allow any food tracking. The Nike community is also not quite as easy to use as with Fitbit. I hooked it up to my Facebook account and it did find a few people but it wouldn’t display the full list of people I had as my friends. The iPhone app is also pretty huge, so I ended up deleting it from my 16GB iPhone to save space. Right around the 1-year mark, I noticed some problems with my Nike FuelBand — the display LCD was not working properly. At first it was fixable by reseting it, but then the problem came back and did not go away. Of course, being a busy mom, I of course did not contact Nike support until the week after my one-year anniversary with Nike FuelBand. Luckily, dealing with Bike Support was easy. They responded quickly to my email and was also available by telephone with US-based customer support reps that are very easy and pleasant to deal with (win!). Nike provides a 90-day grace period for their one-year warranty for Nike FuelBand so I was able to exchange it! I had the option of going to their Nike store or do it via mail. Being that I don’t live that close to a Nike store, but mostly because I am a busy mom who doesn’t like to idea of taking my two toddlers with me on such an exclusion, I chose to do an Advance Exchange where I gave them a credit card number (used in case they don’t receive my return), they mail me out a brand new FuelBand (they even let me chose a new color!) at no charge! My new FuelBand was received in 4 days and I was very happy with the experience. The Fitbit Flex tracks everything that the Fitbit One tracks, except for stairs climbed. The Fitbit Flex was easy to wear but it does not display your tracked status or tell the time like the Fitbit One or Nike FuelBand, so the only time you can see your activity is when you sync either on your phone or at the computer. The 5 dot lights are supposed to tell you how close your are to hitting your goal but I liked it better when I was able to see the numbers without having to check the phone or computer. The Flex does have a nice vibrate alert for when you have achieved your daily goal or for the alarm that you set. I found the light indicator to be a bit cryptic and I was frustrated that I wouldn’t be alerted when the battery needed to be charged unless I was at the computer or checking via the Fitbit iPhone app but that might be due to a problematic unit as opposed to a general feature of the device. I started having problems with my Fitbit Flex about 10 days ago. It would not hold a charge very well (dies within 8 hours) even though a charge is supposed to last 5 days. I checked their support forum and FAQ, followed all the suggestions but none helped my situation. This time around dealing with Fitbit has been slow and frustrating. Their customer service was slower to respond compared to Nike. Fitbit does not offer phone support so you just have to wait and wait for them to return email. This gave me some time to do research and notice customer complaints from folks who ordered the colored bands MONTHS ago and are still waiting for their orders! They did end up returning my email and after several back and forth and sending in my receipt, they sent me a replacement, which arrived about 4 days thereafter. Of course, just as the replacement Flex arrived today, Fitbit announced the new and improved product, the Fitbit Force! It is not due out for another 3-4 weeks but it sure does look like it addresses some of the Flex’s weaknesses when compared to Nike FuelBand. I will be curious to see how this product plays out, and will probably wait for all the reviews to come out before I get one for myself, in spite of how promising it looks.